Take your playing to the next level with AmpliTube 4 Deluxe. It gives you all the hyperrealistic tone and flexibility of AmpliTube 4 plus a ton of extra gear not found in the standard version for a grand total of 140 pieces of gear that includes amplifiers, cabinets, stompboxes, speakers, microphones, rack effects and more. And you get all this in addition to revolutionary features like AmpliTube 4's hyperrealistic cab room, dual 3D mic positioning, individual speaker selection, 8-track recorder, looper and UltraTuner. Want the full treatment? Get AmpliTube 4 Deluxe. AmpliTube 4 Deluxe includes 5 new classic amplifier models that represent some of the best British tones from the 70s, 80s and 90s plus an “Acoustic Sim” model pedal, a double mic setup and UltraTuner, the most precise digital tuner available. As a standalone software and DAW plug-in, AmpliTube 4 Deluxe comes with the gear listed above plus all the other gear you see below. 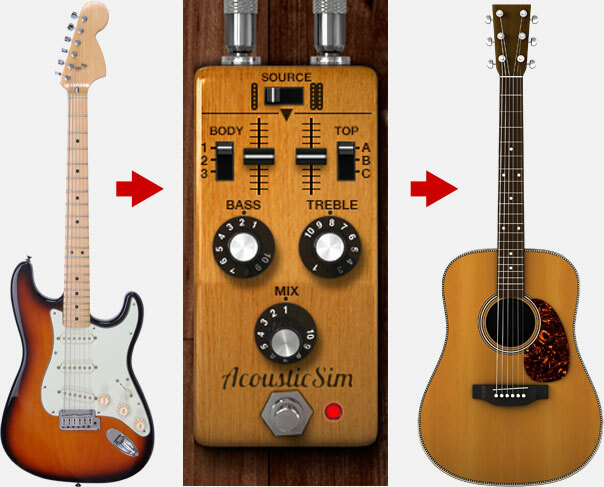 If you currently own a previous version of AmpliTube or individual gear models, you can use the Custom Shop feature to restore all of your gear. the built-in Custom Shop feature. This advanced delay modeled effect can add a variety of depth to the sound, by providing five different delay modes. The delay can also be synced to the host tempo providing even more flexibility. This digital reverb is capable of adding small amount of space to a signal or creating a huge hall around the instrument. Based on a traditional analog 31 bands Graphic EQ, each band has +/- 15 dB boost, plus RESET button (total reset of all bands at 0 dB) and Level slider (+/- 15dB). Perfect for overall tone shaping. This compressor was modeled after a classic tube compressor. It is a very versatile, smooth compressor, and can add great color to the signal. This classic analog stereo chorus model adds depth and space to the input signal. It can also be used as a vibrato effect. This modeled digital chorus effect creates a clear articulate chorus effect. Like the analog chorus, this effect adds depth and space to the input signal, but adds a different color to the overall signal. This model of a digital flanger can create a metallic modulated sound. This effect is a model of a rotary speaker cabinet. Rotary speaker cabinets create a lush vibrato/chorus effect and add a tremendous amount of depth to the sound. The Harmonator is an advanced harmonizing effect with three separate voices, each with independent harmony, level and pan. By entering the key and scale that the instrument is playing, the harmonator analyzes the input signal and track the three independent voices to the correct music key and scale. This pitch shifting effect creates an independent harmony voice that can be blended with the original signal to create harmony lead parts and duet type guitar lines. The stereo enhancer model widens and narrows the stereo image. This model has a flatter frequency response than the other dynamic mics. This mic is highly regarded as a guitar mic and used widely in studios all over the world. This mic model recreates a smooth reaction across a wide spectrum of frequencies, especially attractive in the low area. This means that the Dynamic 20 is a great selection for acoustic and electric bass. Probably the second most popular dynamic mic to use on guitar amps, this model provides a equally pleasing sound, but is a warmer than the 57. This is a model of a faithful and popular microphone used daily in many studios and can be found "hanging around" there or on stages everywhere. This dynamic microphone can deliver honest yet punchy sounds. No microphone collection would be complete without a great small diaphragm condenser mic. This model is based on the standard for small diaphragm mics. As with any good small condenser mic, the 84 provides a clean clear picture of the guitar tone. This is a model of a high-quality large-diaphragm condenser microphone used in famous studios around the world. One of the first with transformerless technology, this microphone came into the world boasting a very high quality of sound with low noise and a very impressive dynamic range. The Condenser 414 is modeled after another highly regarded large diaphragm condenser microphone. It is a bright, open microphone that will flatter big full tones and will also blend beautifully when combined with another cabinet/mic setup. This is a double-ribbon figure-8 microphone with a unique Neodymium element. With a silky-smooth high end and good low end body, a great choice for more vintage-sounding guitar tones, this mic mixes very well with other microphones for very full-bodied recordings. This amp is modeled after a classic American guitar amp. This amp is great for clean to dirty sounds, making ideal for clean and crunchy rhythm, rock, country, blues, and anything else requiring a clean amp capable of getting a little dirty when the music calls for it. This model features yet another classic American amplifier. Unlike the American Tube Clean 1, this model is a smaller combo amp. This amp delivers a clean yet warm tone. This classic American amplifier was at first designed to be a bass amp, but later became one of the most popular American guitar amps ever made. Great for clean tones, it is also versatile in a variety of music genres and playing styles. This is a model of a legendary british amplifier which is one of the most widely recognizable and popular amps of all time. Throughout its life, its legendary tone helped to put many of rocks founding fathers (including 4 guys from Liverpool) on the map and has been a highly sought after sound that is still heard on many albums today. Made popular by the hard rockers of the '80s, this British guitar amp has remained a prized tone for many of today’s guitar players. Able to crank out great tube saturated tone and with ease this model is a go to amp for a variety of heavy rock guitar sounds. The younger sibling to the British Tube Lead 1, this model is capable of great rock tone, leads, and heavy crunch. While grittier and a little more aggressive, it still has the classic tone that has made this family of amps a household name in Rock Guitar. This extremely high quality amplifier delivers a very detailed and clean response on the clean channel, incredibly well defined is the perfect starting point for any kind of sound. Use this channel to get your hyper-driven sounds from stomps only, as well as for creating clean or edgy sounds. Ideal to be driven by overdrive and distortion pedals, the "Green" channel of this iconic amp has been modeled separately. This amp is a model of one of the leaders in hard, driven rock tones made today. Capable of searing leads and heavy crunch, this amp has been rectified to create a modern rock tone that is hard to beat. This is a model of a small vintage amplifier that was basic in design but big in tone. This model is simple but sweet. This is a model of the clean channel from a popular and sought after American amplifier. The signature tone can be heard on many albums and many stages around the world. Experience a sparkling clean with the capability for a touch of crunch when cranked up. This is the lead channel of a renowned three-channel American amplifier, known for excelling at both clean and lead sounds. This channel can be BIG and aggressive when you want some California crunch and smooth, tasty sustained lead sounds too. Take yourself back to the '60s with this quintessential amp. Not just any version, but an accurate model of the well-known and loved version of an already spectacular amplifier. If you want some British sound, you can find it here. With more options than most bass amps, this model gives great flexibility in tone and power. This is a model of a solid state powerhouse bass amplifier with great tone-shaping controls, a warm sound unlike most solid state amps, and a sought-after preamp. It may have Jazz in its name, but this versatile clean sound can be heard in many genres. Many of the top metal players keep this not-so-secret weapon in the studio for great clean sounds. This model features a solid state bass preamp, EQ, and a solid state power amp module. It cleans up beautifully and drives just as hard. Based on the classic AmpliTube model, this amp features LOTS of gain for that over the edge distortion sound. Similar to modern tube lead sound in character, Modern Hi-Gain provides an additional take on that type of sound. This amp model is clean. It provides a very uncolored signal to the guitar, perfect for jazz. It could be compared to amps like the Jazz Amp 120, so ideal for sparkling clean tones. Based on AmpliTube 1’s fuzz amp, this model is a very distinct and distorted sound, reminiscent of 60’s fuzz sounds. This model features a precise solid state lead sound. It has a darker tone and excels at high gain lead tones. It is very suitable for hard rock leads and it’s gain is very stable, making it easy to use at low volume levels. This amp toured and recorded for years with one of the biggest and bold rock bands ever. Classic rock tones are a natural with this amp, but it is also known for being used by one of the most famous jazz bassists of all time. Show no quarter and make your bass kill with this amp - solid state but loud and proud.